Does anyone here have any experience dealing with Patrick Barta? I would like to order a sword from him, but his site lists no order page, just a contact page to e-mail him to discuss ordering. So I duly sent off an e-mail telling him what I'd like to order. That was a week ago, and I've received no reply. How is one supposed to order anything from him if he doesn't return e-mails? I've got money in hand, ready to order, and I know there's liable to be a waiting list, but I think sometime in the next couple of years, the insane amount of spending the U.S. government is engaging in, and the debt we are piling up is almost certainly going to lead to runaway inflation. When that happens, and the dollar falls against other currencies, his prices are going to go up way out of my reach, so I'd like to get an order in before then. As Petr has quoted mr barta is not on the pc very often and it does take some time to contact you as he is realy busy. my emails some times up to an week and longer but always explaned an reasonable answer. That said you are in for an nail biting time for the next three years as the the same for me as i have orderd one more sword. Allow me to add my experience as well. I sent him an email on 1/1/10 and he confirmed my slot in his queue on 1/10/10 so it does take a little bit of time for a return, but he will get in touch with you. It's a 3 year wait but as you can see from his website and photos on this forum, it will be worth it. To those of you who've had success contacting him, are you using his email from his site or another? Maybe MSN won't talk with hotmail so you may have to just type the address into your "To" box. Well, I finally heard back from him. I asked about getting him to make me a Celtic La Tene sword like the one under catalog number 126 on his site -- the 2nd century BC type. I think the thing is gorgeous, and there's really almost nothing about it I'd be inclined to change, but I know he's a custom sword maker who has no real desire to make exactly the same piece twice, and I hate to ask him to do it. So after giving it a little thought, I sketched out an alternative hilt design myself, with a hardwood guard and pommel much like the ones he's put on La Tene swords before, and using a somewhat earlier Celtiberian sword (dound at the Alcacer do Sal cemetery in Portugal) as inspiration for the shape of the grip. I also sketched out a little spiral design on one of the facets, but I am not sure whether it would be better to decorate the entire grip so, or leave it plain. God knows if any original La Tene swords ever looked like this. They may have, as only a small number of those made survive to the present day, and of those, all but a tiny handful have long since lost all their organic hilt components. Since this is so, most reproduction La Tene sword hilts are somewhat conjectural in any case, and since I used another, albeit earlier, Celtic sword for inspiration, I feel relatively comfortable with it. I quite like the look of it as well. We'll see what he thinks of it, and I now have about three years to hash all the details out with him. 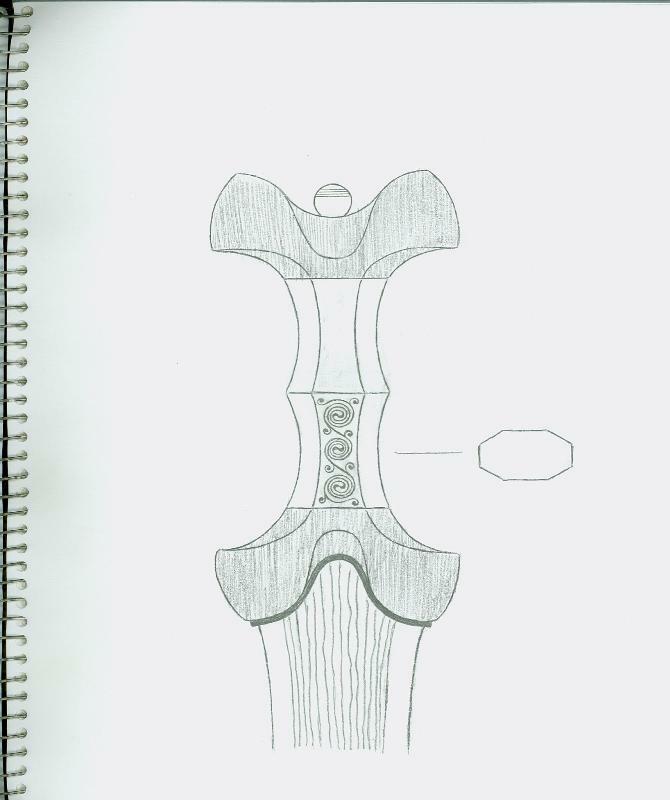 Here is the sketch of the sword if anyone's interested. I am so glad that you received news from patrick and that you have an place in his que to have an sword made. As for sword 126 i ordered the same one and the scabbard came from an village near where i was born. Well, he got back to me again today, and seems to like the sketch I sent him, so he'll make it. Pity I've got to wait three years. Just make sure to post pics when you do get it. I'm excited to see how it turns out. I emailed him multiple times and last I heard I was on his waiting list for almost two years. I went to "check-in" and he said he never put me on his waiting list. So he asked me a few more questions which I answered, and wrote a couple more emails to ask about being put back on his waiting list and he never responded. Frustrated, I gave up on trying to communicate with him. I guess he has too much buisness and doesn't care. I was very thorough in my communication just as everyone here with whom I have dealth with knows this. I am sorry to say my experience with Patrick has been much the same as Chris, However with said I chalk this up as a language barrier. I belive the his swords are with it and a more patient man than I would be greatly reworded for there time and effort. I was not nearly as frustrated with him as I am in my experience with Guss Trim who received my money for a basket hilt broad sword back in 2003 and still has yet to provide me a sword or return my money.